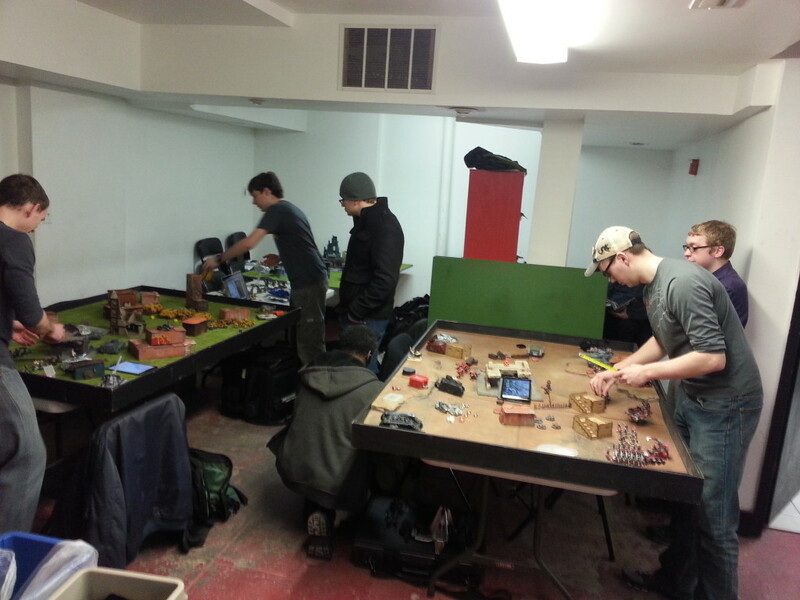 Redcap’s was bumpin’ last night, with 15 people there for Thursday night 40k. Byron and I got in a 1750 point game, him practicing a bit for a tournament he’s playing on Saturday. 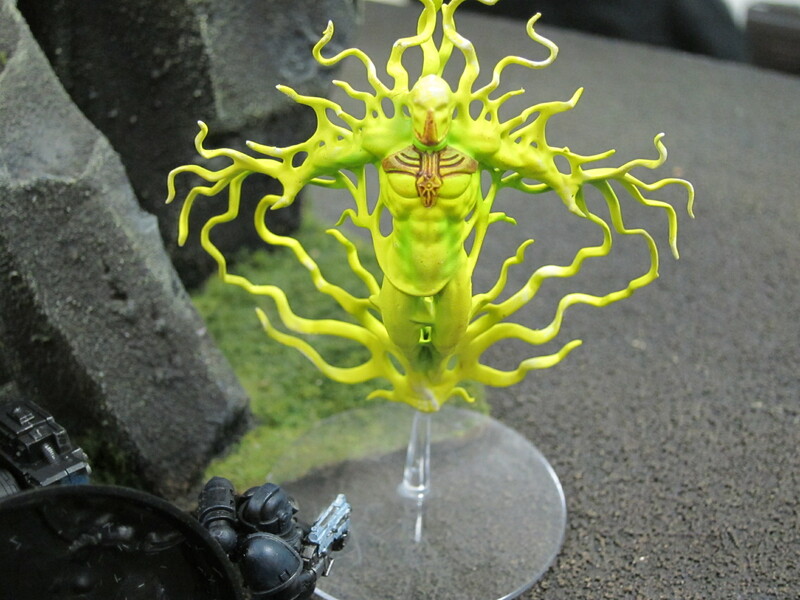 The gimmick is that he’s got a good number of psykers and he’s trying really hard to get Vortex of Doom on a Terminator psyker or two so it can be thrown on the deep strike—it’s a heavy blast, so it’s less useful on a psyker without Relentless. 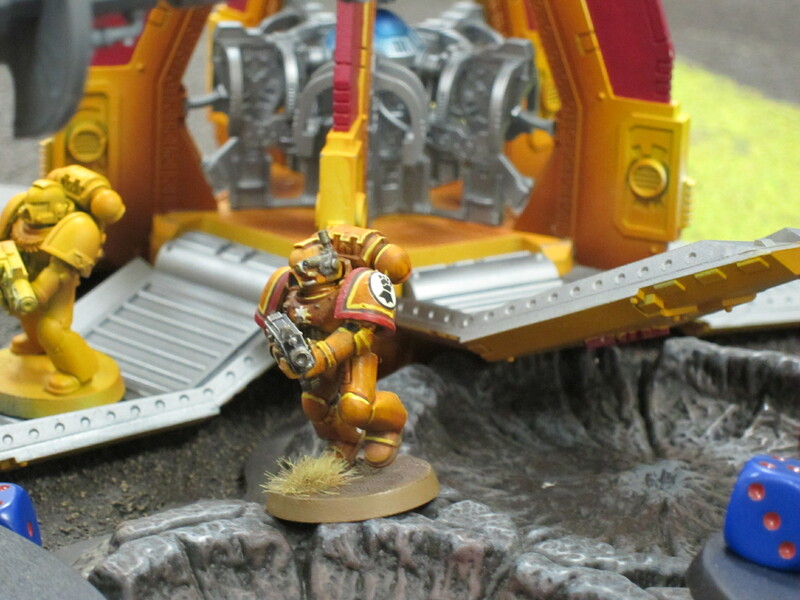 He’s using the servo skulls to help kill the scatter on both his deep striking and those vortex blasts, as well as a formation that lets him deep strike reserves on Turn 1. The formation also lets his guys run & shoot in the same phase, to increase his mobility on the ground. Finally, he’s boosting his odds of getting Turn 1 and dropping those blasts right away by bringing Coteaz to force or take a Seize reroll. That setup can be pretty devastating if everything goes right. 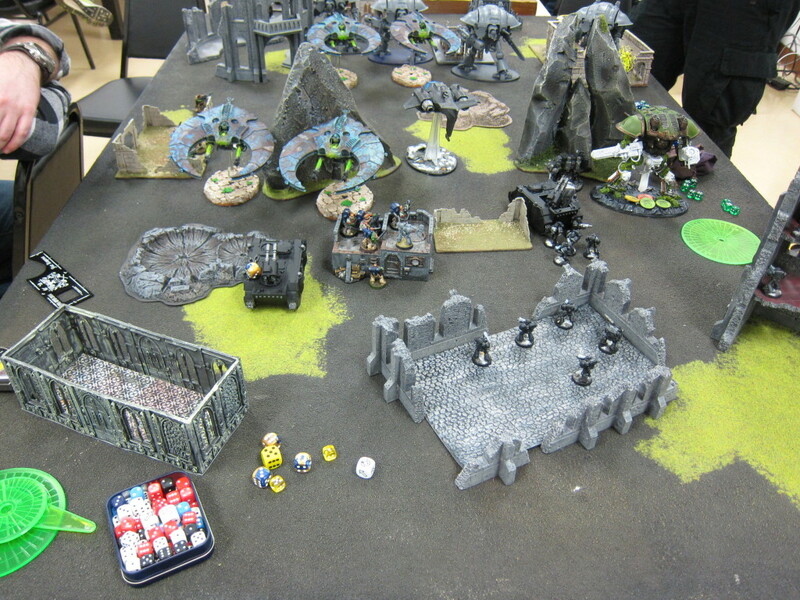 Colin got blown away in the November tournament as Byron got the Vortex, got first turn, dropped near perfectly, threw the blasts ideally, and wiped out a huge chunk of the Iron Warriors’ army in the first turn. 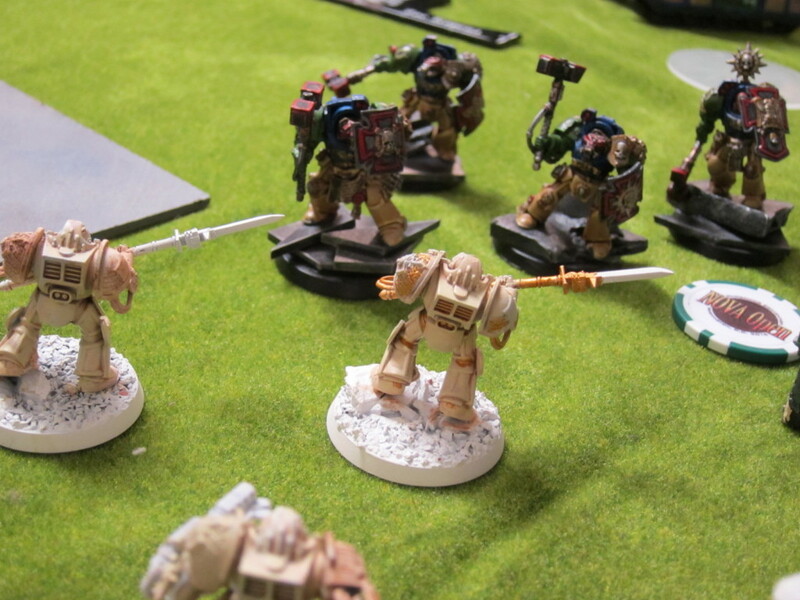 The downside is that if the Grey Knights don’t go first and the opponent has a good alpha strike or high mobility, Byron’s basically ceding board control. He also doesn’t have a ton of units to spread around the board if there are a bunch of objectives, or the mobility to shift positions and adapt. Sauvon and Angholan scout the ruins. Objective cards are not secret. Both of us wound up placing our three objectives evenly spaced about a foot from our respective table edges. 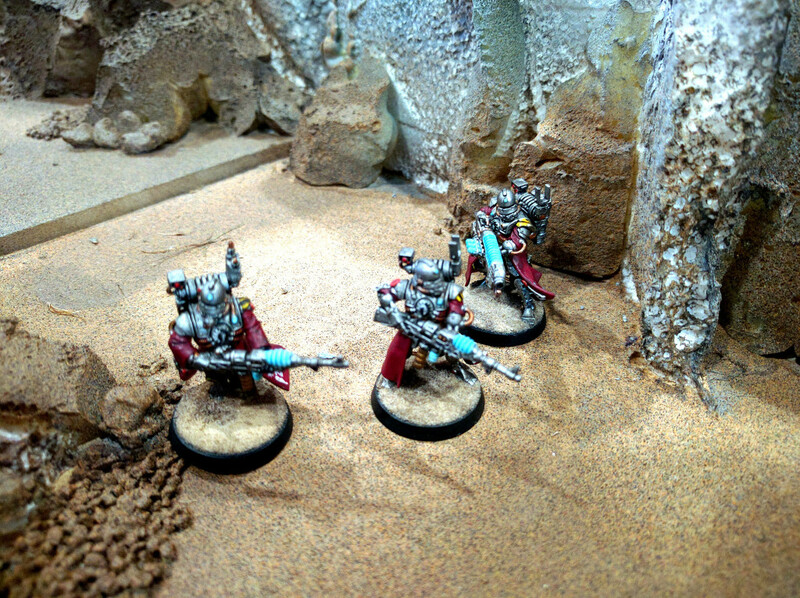 Kingbreakers deployed with at least one unit essentially already on each of my three home objectives. 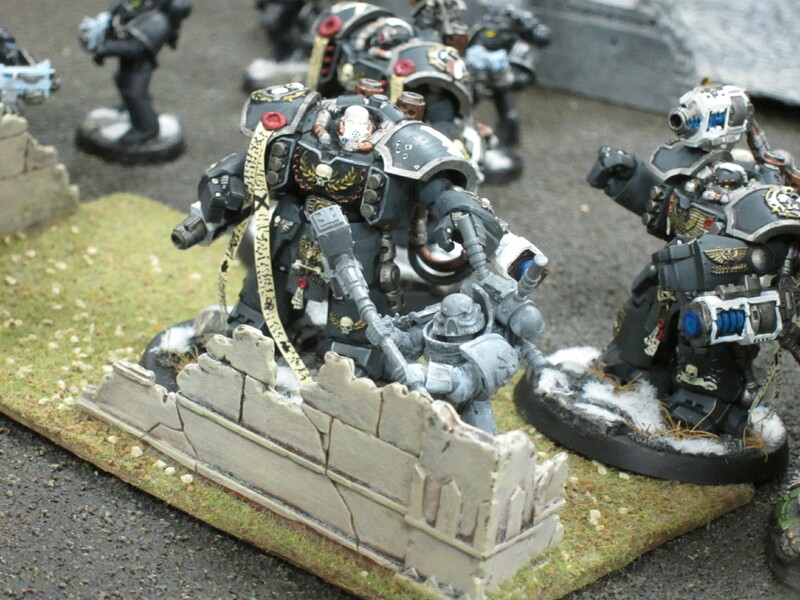 Grey Knights deployed just Coteaz and the Acolyte+Servitor blob on an objective tucked into a corner. 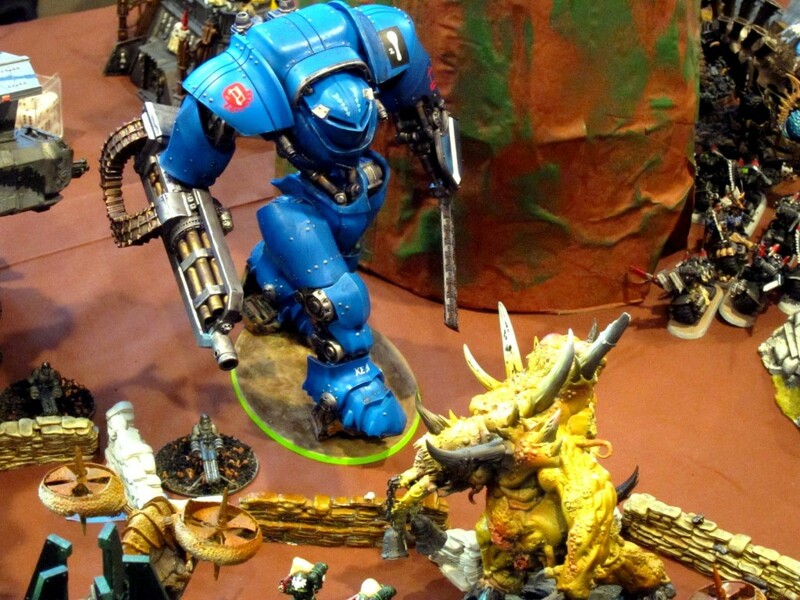 In the land of Terminators, the storm-hammered are king. I survived the forced reroll to keep first turn. Squad Harbinger dropped on one of the opposing objectives and moved to remove a servo skull and create a bubble wrap pocket for the Knight. 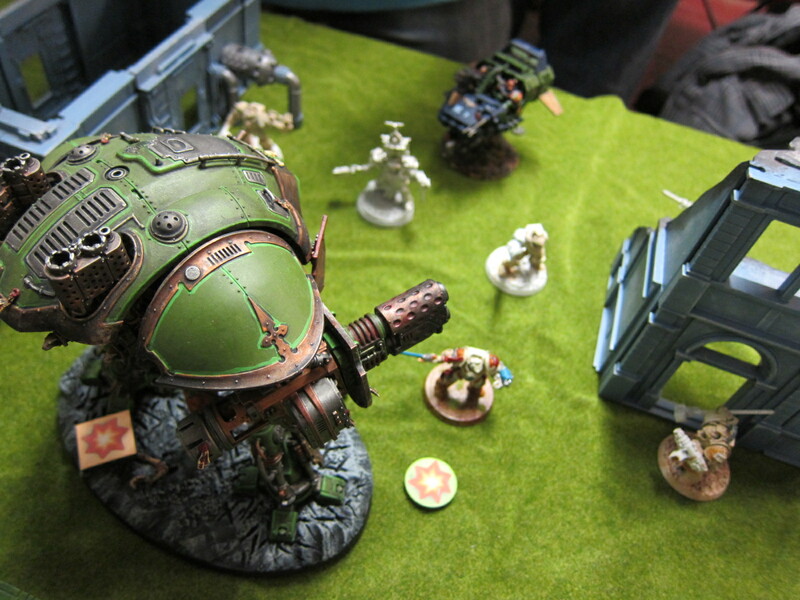 The Knight advanced right onto the table center line, backed up against a large line of sight blocker. 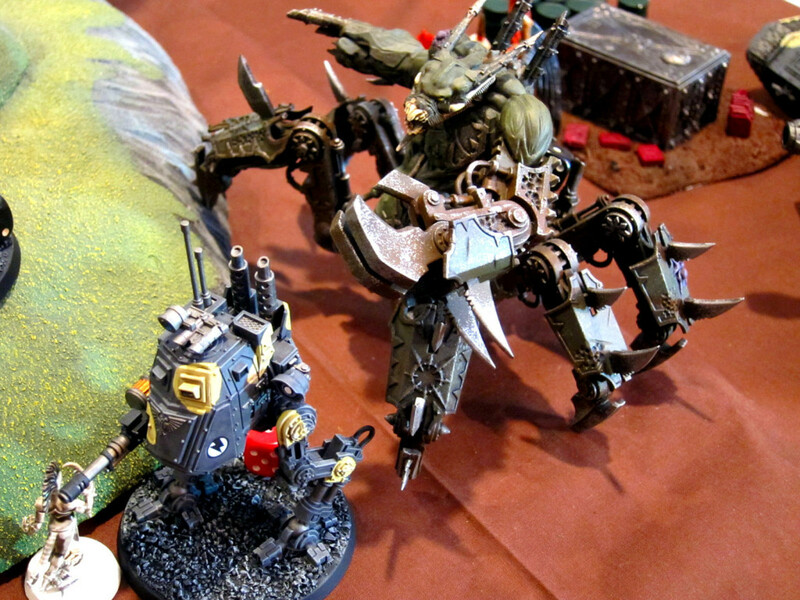 Terminators, a Landspeeder, and a Rhino filled in the circle around that terrain to create a buffer around the Knight. Angholan + Scolirus tried to drop on Coteaz but played it too safe and scattered well back toward centerfield. 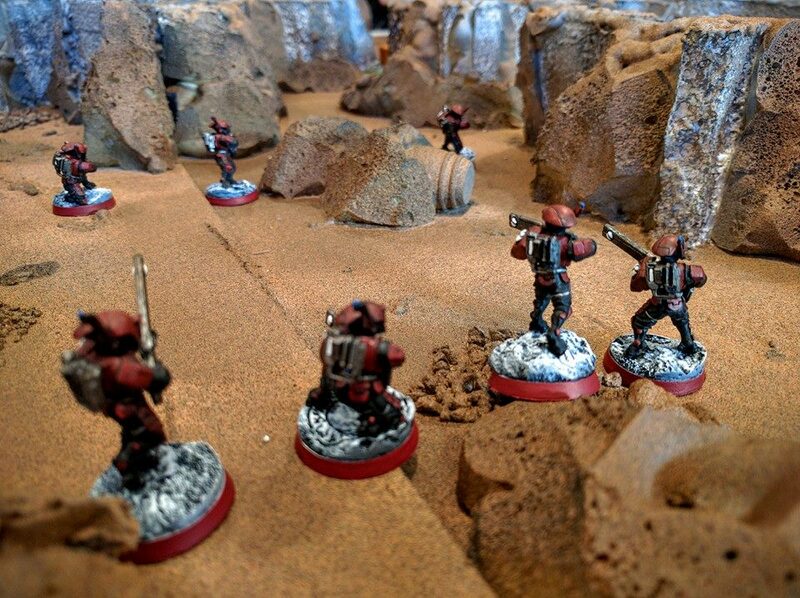 Other Tacticals ran around to remove servo skulls and hunker down on objective markers, taking 2 victory points off the bat. 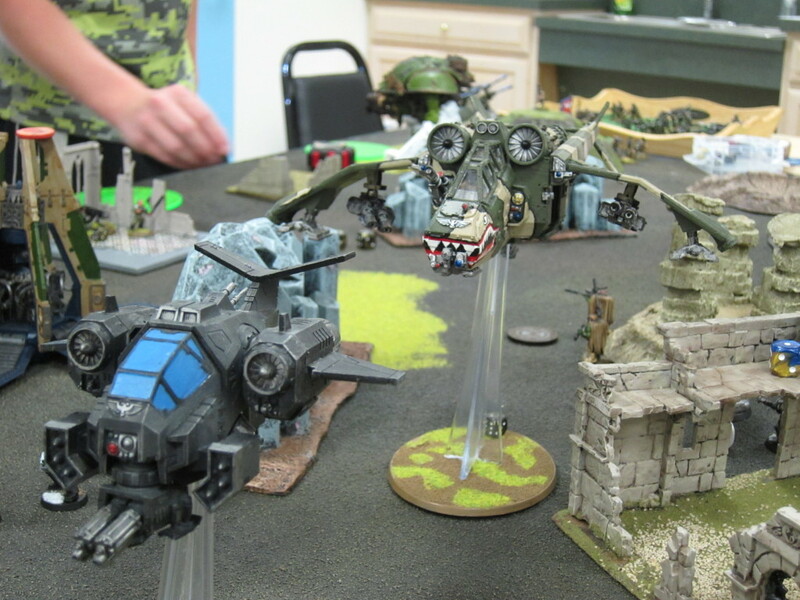 Following that, all the GK but the Stormraven came in. One Librarian threw a Vortex of Doom to blow away a Terminator, and another group with heavy shooting caught Harbinger off guard and wiped out his squad for First Blood. 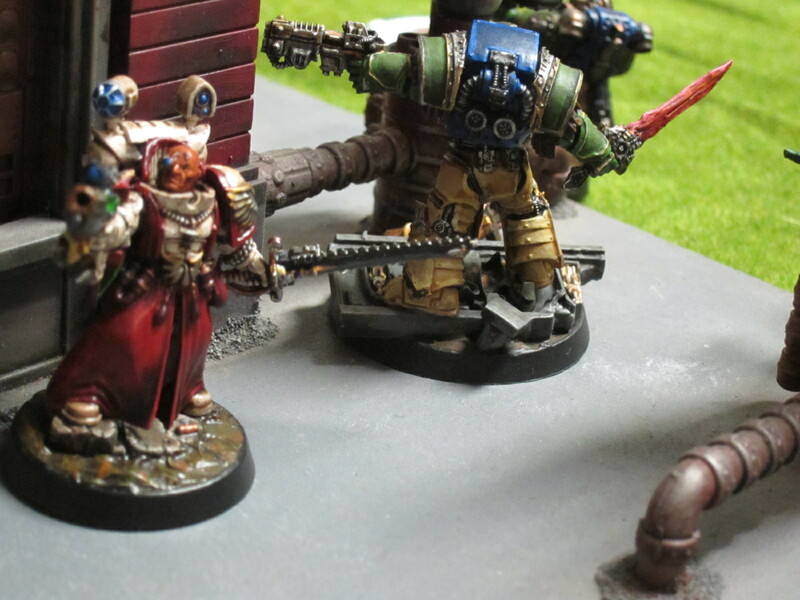 The Marines fought back though, with Terminators krumping one squad of Terminators and the Imperial Knight another. Squads Scolirus and Harmon both tackled the Dreadknight in their midst and brought it down to one wound, but not before it had knocked Captain Angholan out of the fight for Slay the Warlord and then shunted away. Kingbreakers though claimed a substantial 5 victory points while only yielding 1 for the turn. 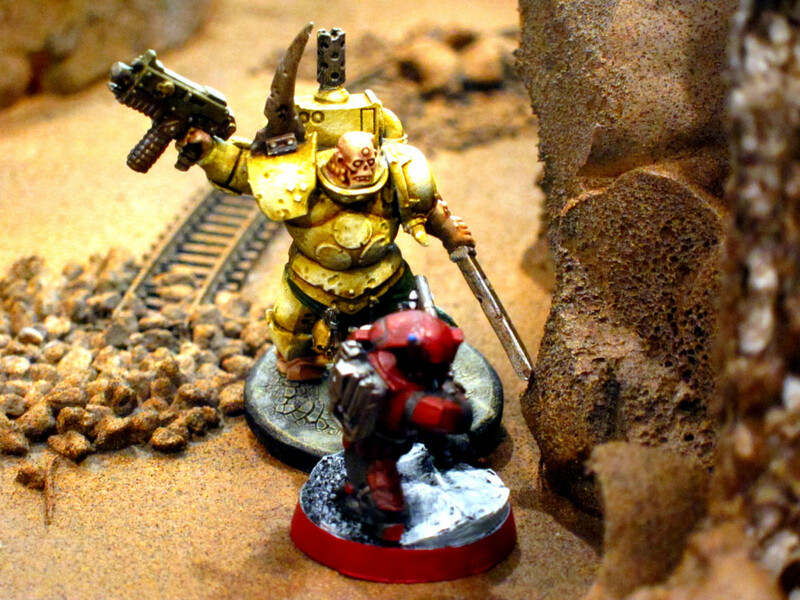 Although only mid-battle, at that point the momentum was overwhelmingly for the Emperor’s finest—the Kingbreakers. 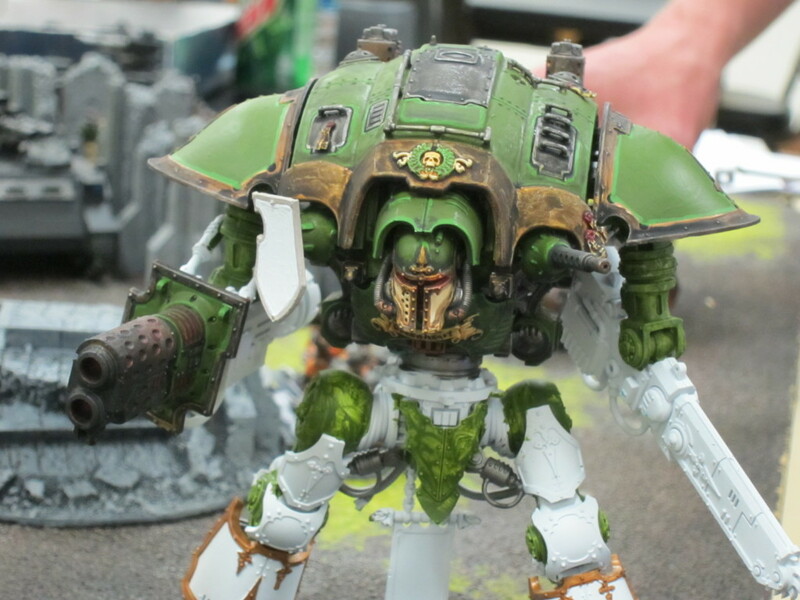 Knight Greenheart demolished the last unit of Terminators and the opposing Inquisitor Warlord, the Coteaz blob was being whittled away and having little impact, the Dreadknight was on its last legs, and the Stormraven was forced to prioritize helping it out. 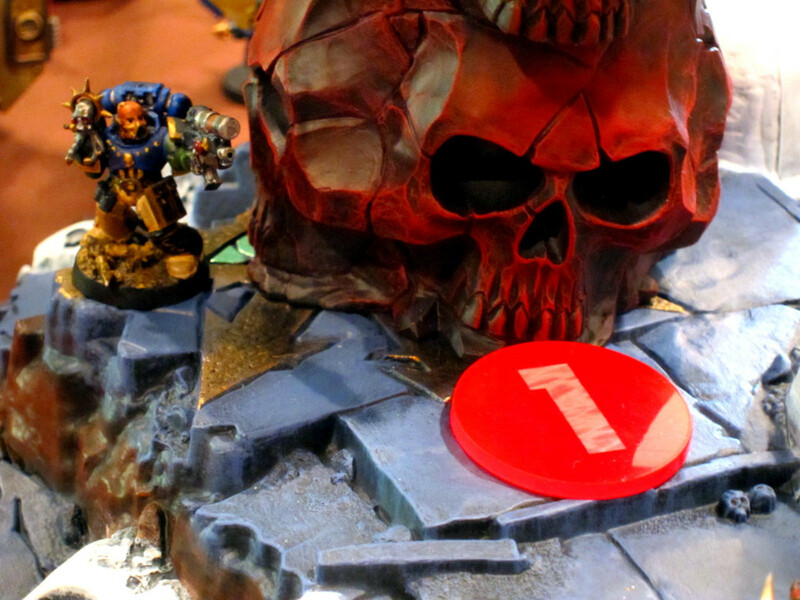 Kingbreakers claimed another 4 victory points to just 1 for the GK, who promptly fled the field of battle for the day. 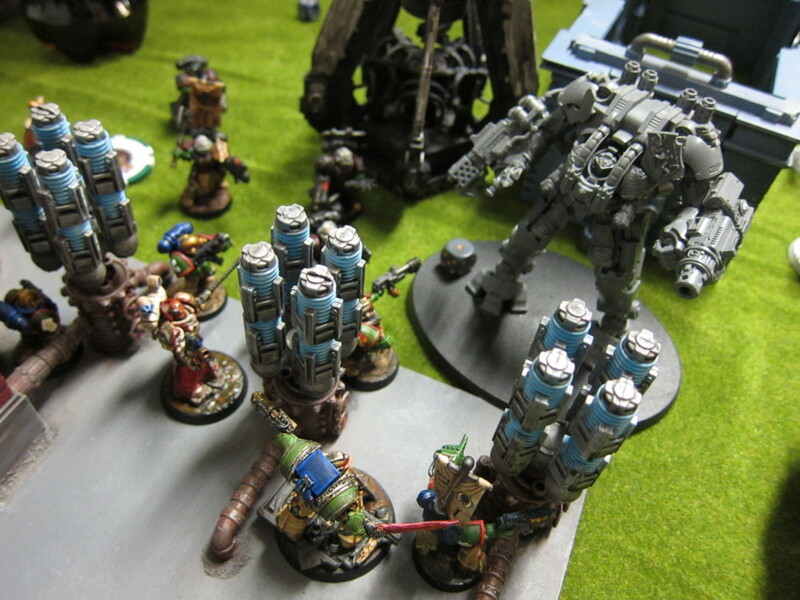 Multiple squads go at the Dreadknight at the power station. After four turns the Kingbreakers were up 11 to 5, poised to take several more points, and we called it for time. Byron’s army had relatively few options to deal with the Knight. Very few of his models had any weapons that could hurt it, in both shooting and assault. He was really counting on the Vortex of Doom to take it out, but the first turn bubble wrap forced all his units come down far enough away to negate that. 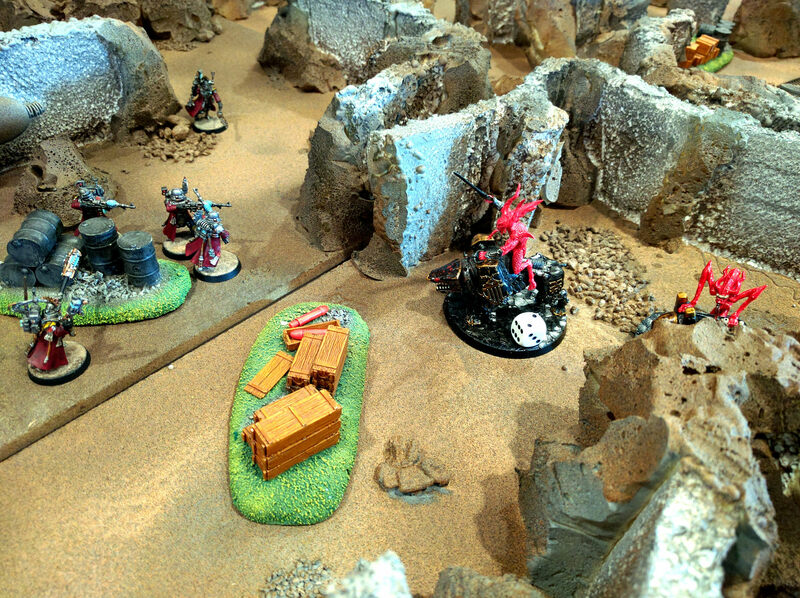 I was able to make good use of a large piece of terrain which had no windows, so he couldn’t risk deep striking on it, scattering behind, and getting no shots at all. In the one sector I couldn’t really get much bubble wrap into he fortunately scattered out of. Multiple units of mine were then also well placed and had the tools to decisively counter-attack before his units could do more damage. 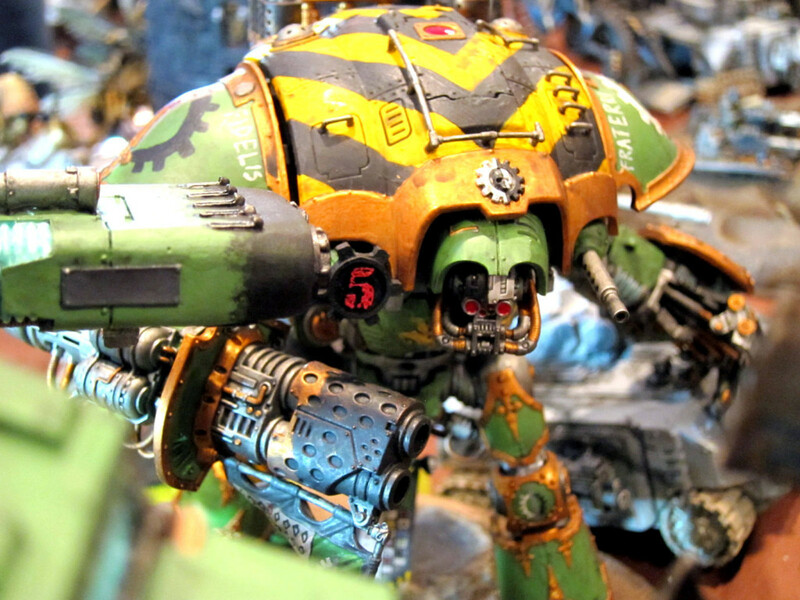 Assault Terminators are basically designed to fight against this kind of opposing force, and the Knight’s super well equipped to shoot and assault Terminators. Bubble wrapping the Knight as best I could, actually kind of difficult to do while preserving its rapid movement. On straight kill points this would have been actually a very close game given how many more units I field. 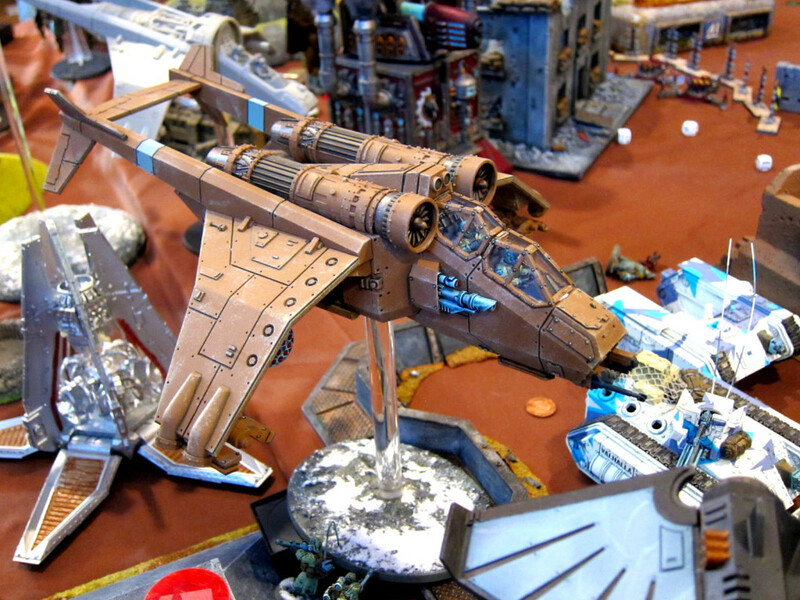 With the Stormraven forced to hover in order to keep shooting at priority targets, it was actually possible in another turn or two the GK would have been tabled. At the end only the Stormraven, Coteaz + handful of Acolyte chumps, and the Dreadknight with 1 wound left remained, for something like 6 KP scored by me. Kingbreakers meanwhile had lost 7 KP. 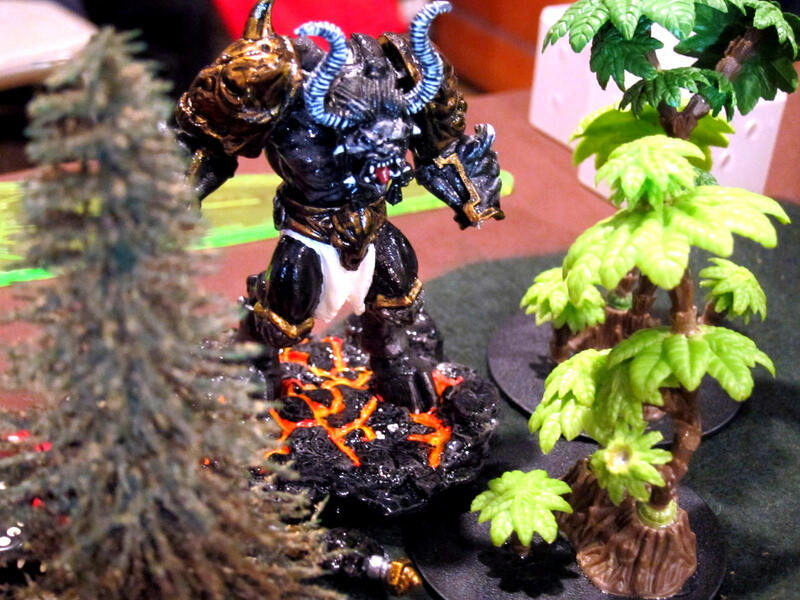 Objectives were the order of the day though, and the Kingbreakers are all about that game. A super elite, small unit count army like this kind of Grey Knights outfit is always going to have a hard time with 5 or 6 objective markers on the table. Add in that most of it is infantry on foot and it’s going to have limited ability to run around and adapt to the objective cards drawn. That’s particularly true if they’re forced to centralize on one particular target like the Imperial Knight, and hit a couple walls like the Thunderhammer Terminators. Meanwhile, I’ve got combat squads all over, Drop Pods on objectives, and Landspeeders as well as a Rhino to scoot around. I particularly enjoyed deploying an empty Rhino, which confused Byron but did excellent double duty holding down an objective and blocking for the Knight while its Tacticals combat squadded and deployed to hold two other objectives. I haven’t actually played many Malestrom games, and in part a bunch of us went to play last night specifically to play that and think about using it in upcoming tournaments. The basic ruleset Byron and I used seemed pretty reasonable. In particular, I like it much more than setups were you only have one card at a time, and/or only have a single turn to claim objectives. Holding three cards potentially over multiple turns gives you a lot more ability to actually plan and work toward a strategic goal. That said, it retains one of the problems I see with Maelstrom in that it still emphasises immediate reactions rather than game-long strategy. There’s definitely still overaching strategy, e.g., my efforts to control the entire board raked in victory points here as I kept drawing cards I already met or could easily achieve. However, as a counter-example, I couldn’t decide how hard to press against the Coteaz objective because who knew if I would even draw cards scoring that objective. In a more traditional game I’d be able to evaluate that more precisely and make a more concrete strategic decision. One change I would also consider to these basic rules is not scoring cards until Turn 2. I’m all about it because it gives Drop Pod and similar alpha strike armies a big opportunity to score quickly. But it really penalizes armies with limited mobility, already arguably an issue with Maelstrom. In any event, it was a good game and I was pleased to win decisively as I had been concerned about this army after watching it wipe out several good players in our tournaments. 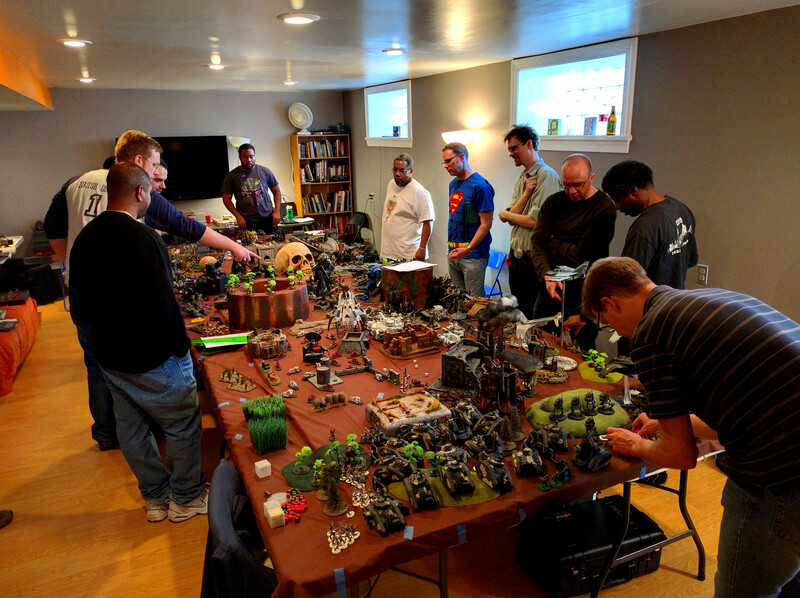 Although I’m not convinced how strong it actually is, I am pleased to see Byron build an army around the Vortex of Doom as I am a huge fan of throwing vortexes around the table. 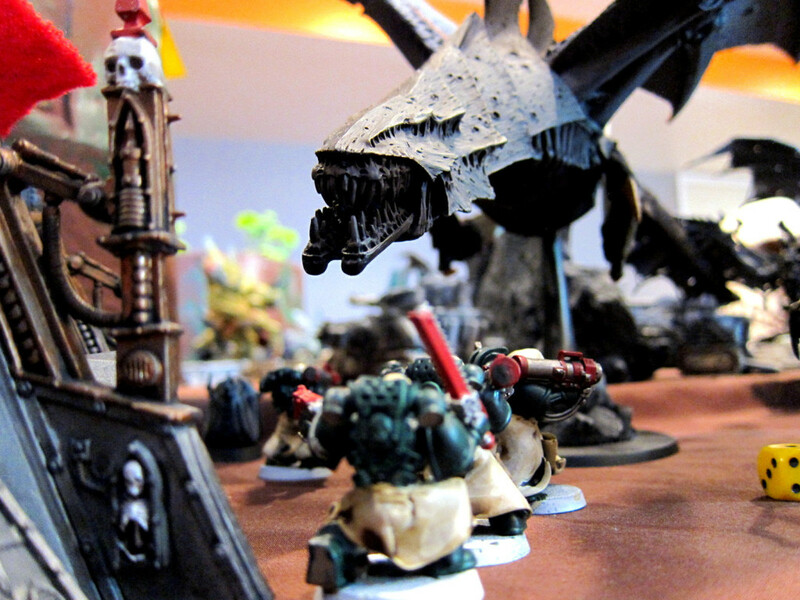 Throughout 5th edition that was a big part of my army, but I let it go when psyker powers became randomized. 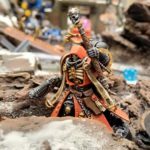 Especially with the Grey Knights though he’s easily able to go the other way, and field enough psykers to both get the power and throw a bunch of dice at it. Over the next couple days I should have more thoughts up on Maelstrom as I sketch ideas to include it in the February tournament. 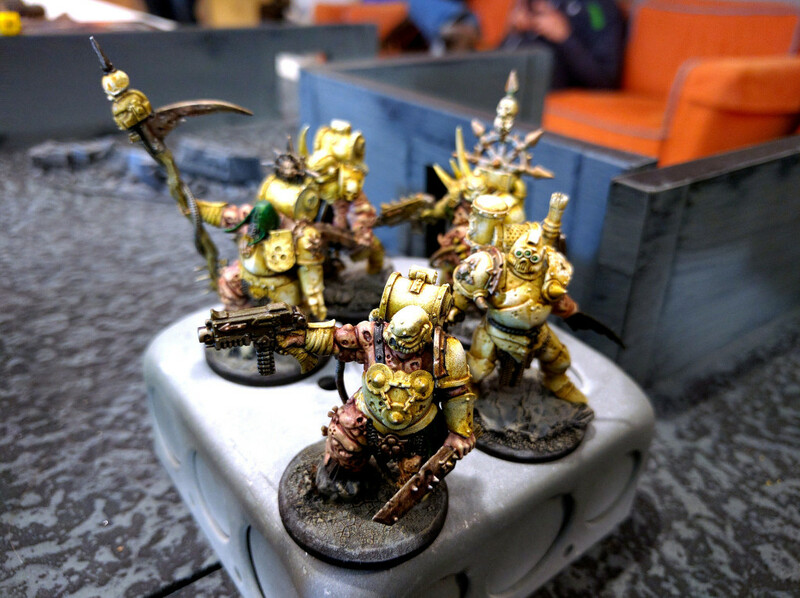 Saturday the dynamic duos of Colin and Brett and John L and I went out for a Berks PA 40K Doubles Tournament at Railyard Hobbies. First of all, that place is amazing. I haven’t been to the Railyard before, and it blew my mind. It’s ridiculously huge, and the terrain building supplies are all but endless. 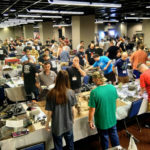 Definitely a good tournament venue, and though a bit out of the way from Center City Philly, potentially worth the trip for terrain materials and tools. 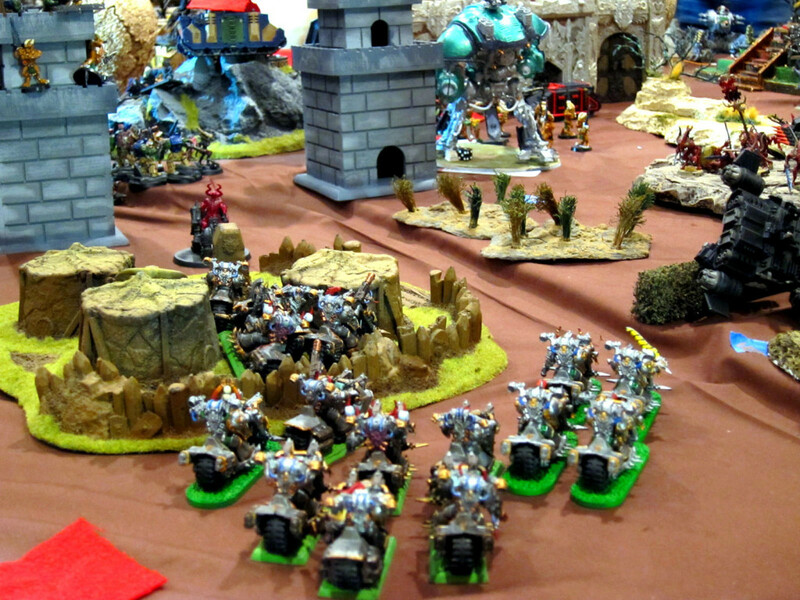 Armies were 1500 points per player, battle forged but no other restrictions. Both players on a team fielded a warlord. All partners were treated as Allies of Convenience. A single psychic warp charge pool was shared. 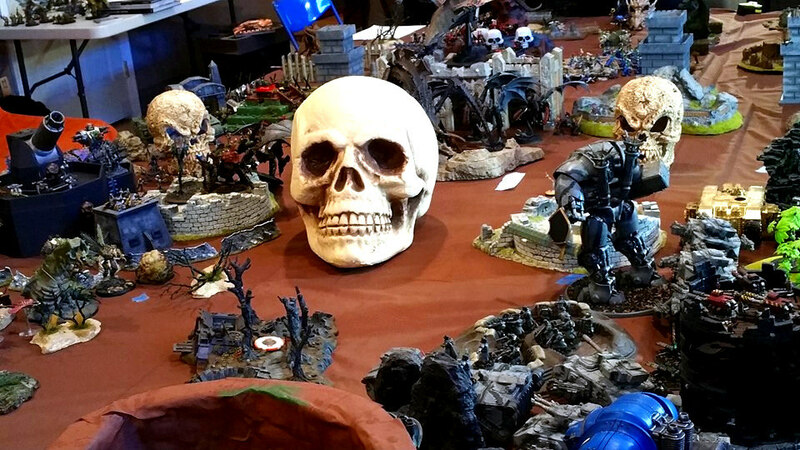 Eight teams showed, with various Marines, Imperial Guard, Daemons and Chaos Marines, a small Eldar presence, Necrons, some Imperial Knights, a couple more Knights dropping out of a Thunderhawk, and oh yeah a C’Tan and his buddies who just happen to also be Knights. Photos are in the Flickr gallery. 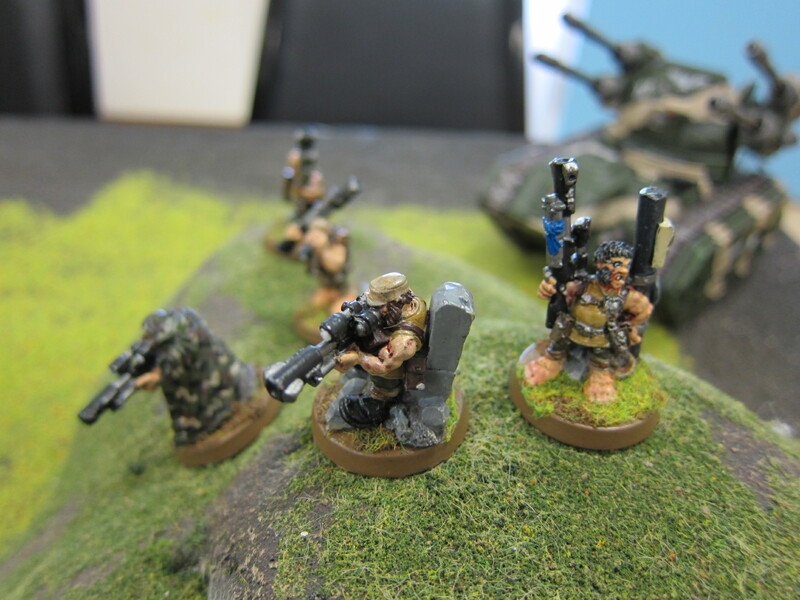 John and I fielded what I feel is a well balanced and relatively normal army. Originally we were going to divide into John on offense and me on defense. But then we were both busy and didn’t coordinate at all, so we wound up with a combined thrust across backfield, midfield, and the frontline. 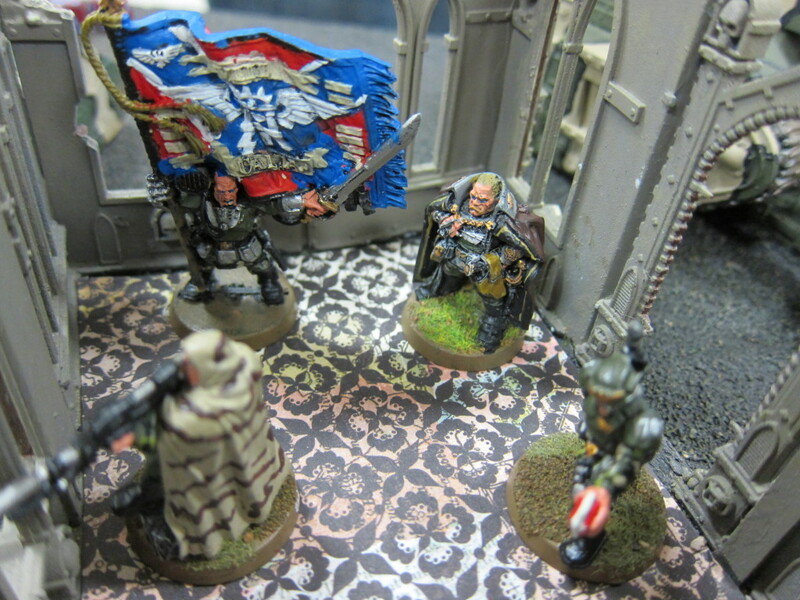 The few “gimmicks” in there are the Knight, Coteaz, the Void Shield Bunker, and the Librarian with The Gorgon’s Chain hanging out with Centurions hoping to cast Invisibility on them. Well, ok, maybe that’s a couple of gimmicks. But it’s no re-rollable 3++ on a 6 HP model or a world-ending god shard. And it’s a solidly fluffy, Marines-out-for-a-stroll force composition. 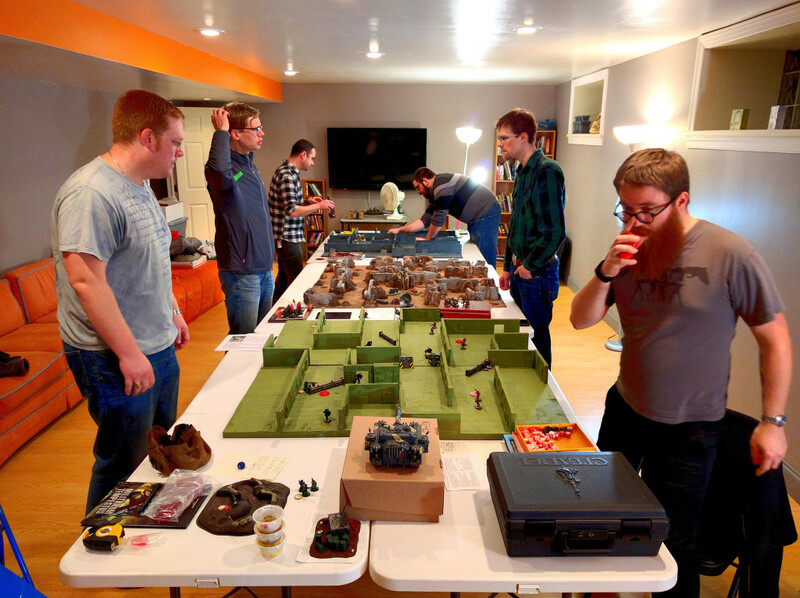 First up we faced Ethan and Dustin with Imperial Guard and Space Wolves with a Knight. Mission was Dawn of War (12″), five objectives, double value Slay (effectively quadruple if you tagged both opposing warlords), Linebreaker, and bonus points for killing both opposing warlords while losing none of your own. These guys did a good job deploying, in part through simply having so much to field. 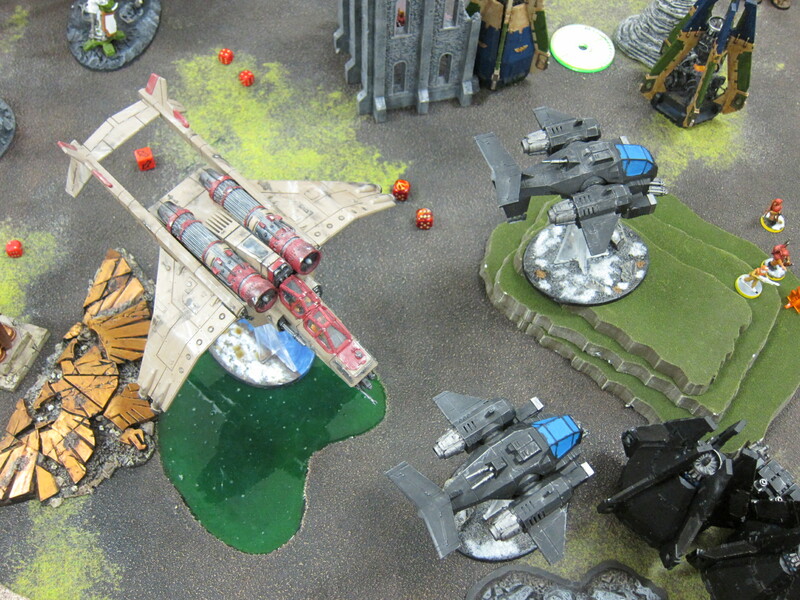 We had no juicy, vulnerable alpha strike targets and wound up taking risky drops against the opposing Knight, tucked hard into a corner and surrounded by Guardsmen. One Combat Squad went well off course but luckily toward our own forces, and bunkered down in ruins on an objective until it had a chance to pop out late-game and help slag a Punisher. The joint Sternguard attack put five hull points on the traitor Knight but didn’t manage to take it down before being summarily blown off the board. A lone surviving veteran did tie up the enemy Knight in combat for a turn or two, though this mostly just protected it from our lascannons. 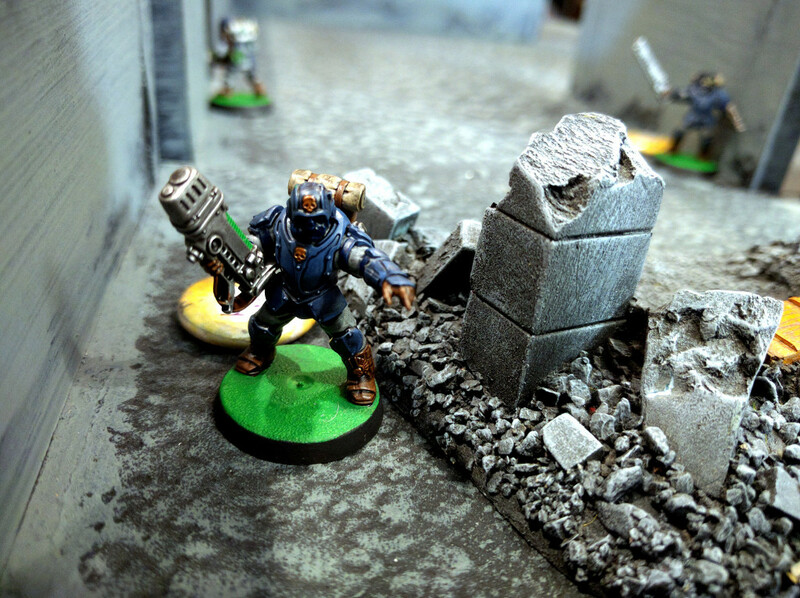 Our Knight meanwhile trudged forward dropping melta on Terminators and Guard tanks, eventually walking onto an opposing objective. 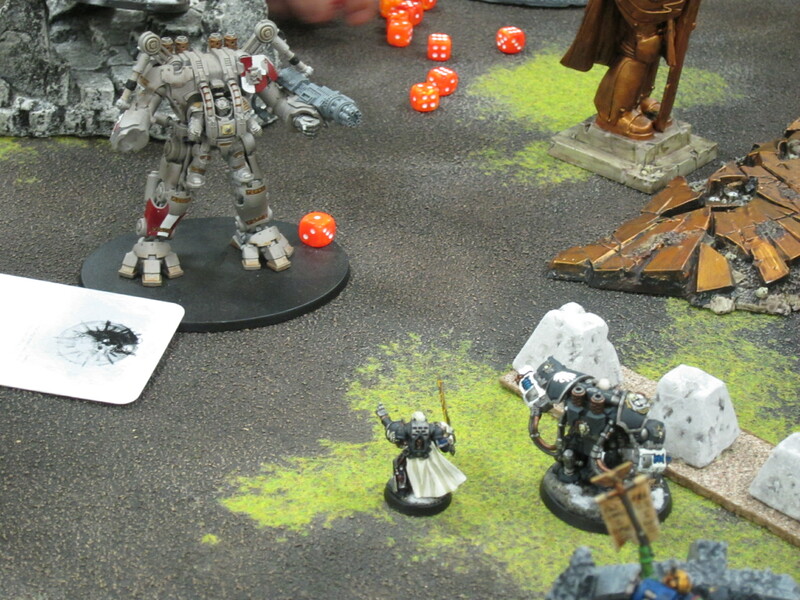 Centurions defended our center table and wiped out Terminators that made it to threatening positions. Squad Scolirus and Raukaan Tacticals burned out Creed and the Guard’s Company Command, but paid for it when Captain Angholan was forced to face the full withering fire of a Punisher at point blank and was mortally wounded. 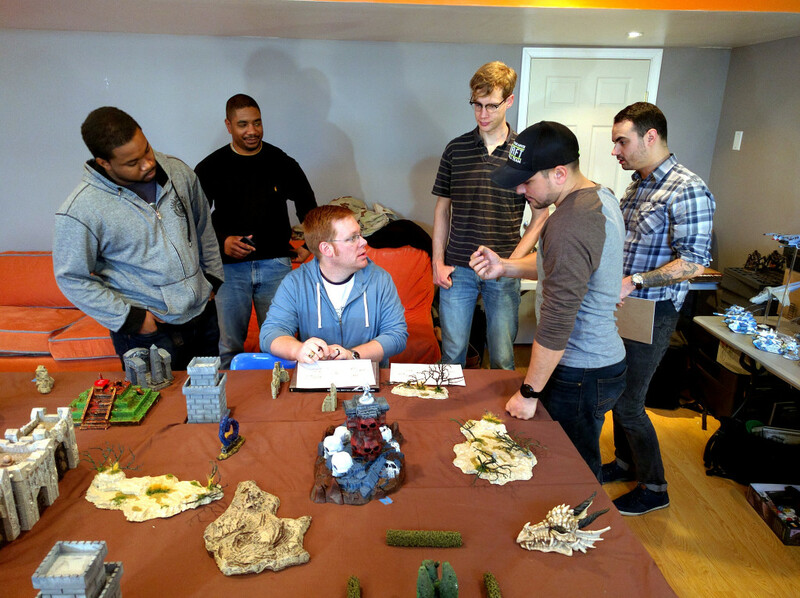 With things looking grim in the mid-game, the Space Wolves and Guardsmen started taking chances on risky reserve drops with terrible results teleporting in and dropping from flyers, further boosting our momentum. We wound up with all the objectives and secondaries, only missing out on max points by losing my warlord. Unfortunately I took a bunch of chances on Angholan withstanding the Punisher, trying to tank wounds on him rather than his squad. 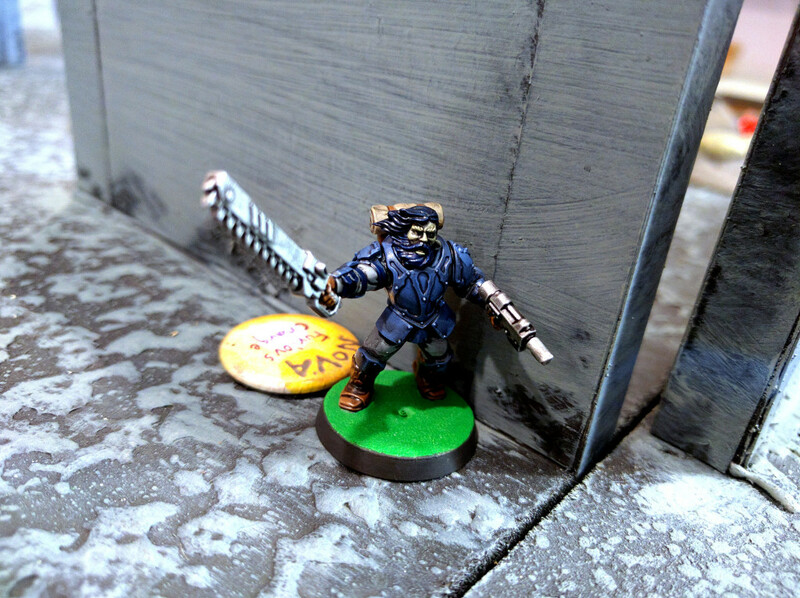 He actually made it through the main gun pretty ok, but I forgot it would also then be shooting heavy bolters and a stubber at him and it was just too much. On the upside, it seemed like almost nobody got this bonus either. 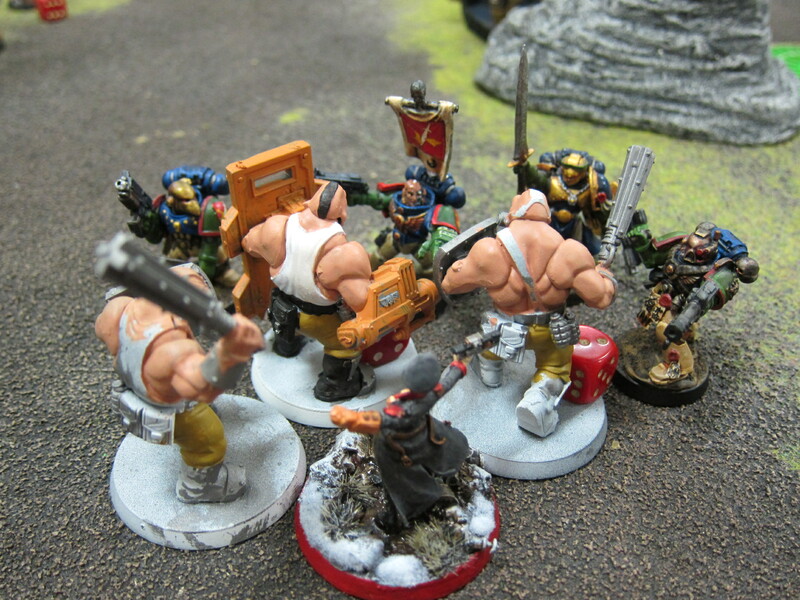 The big thing here was that we had a bunch of weapons to fight Terminators, enough alpha strike and mobility to pen their army up against their back line, and nothing especially fearful of the Guard’s large blasts or heavy weaponry. 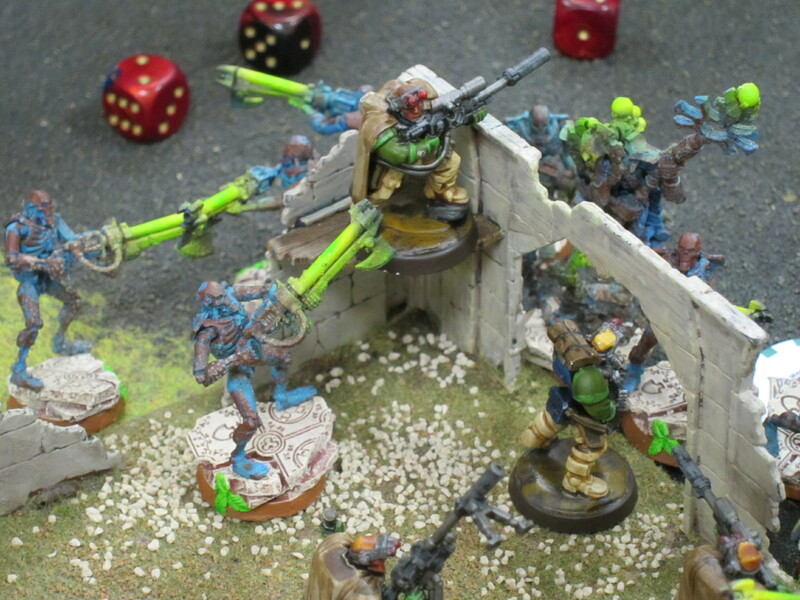 Our small Combat Squads all over the place made for inefficient blast targets, and a combination of good line-of-sight blockers and the Knight’s shield rendered the missile launcher and lascannon teams largely moot until we could take them out. 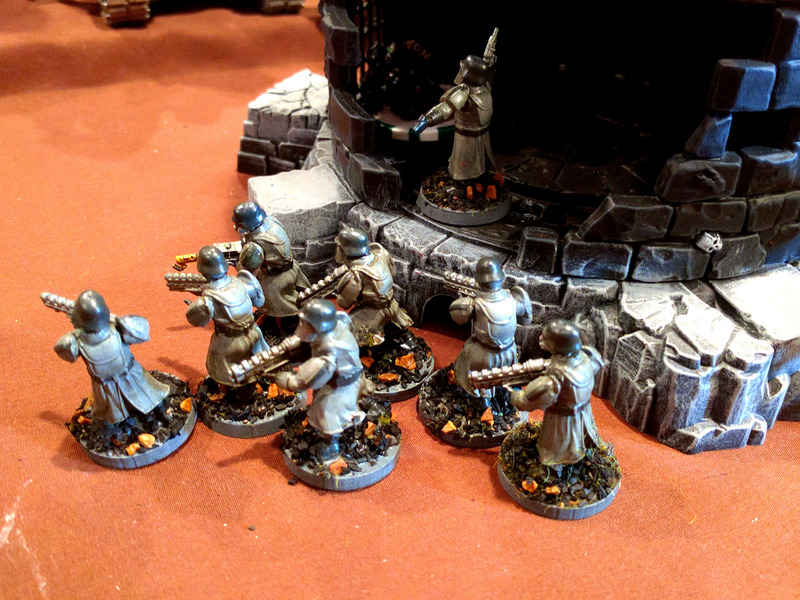 Next up was Zack and Brad with Imperial Guard and Grey Knights. 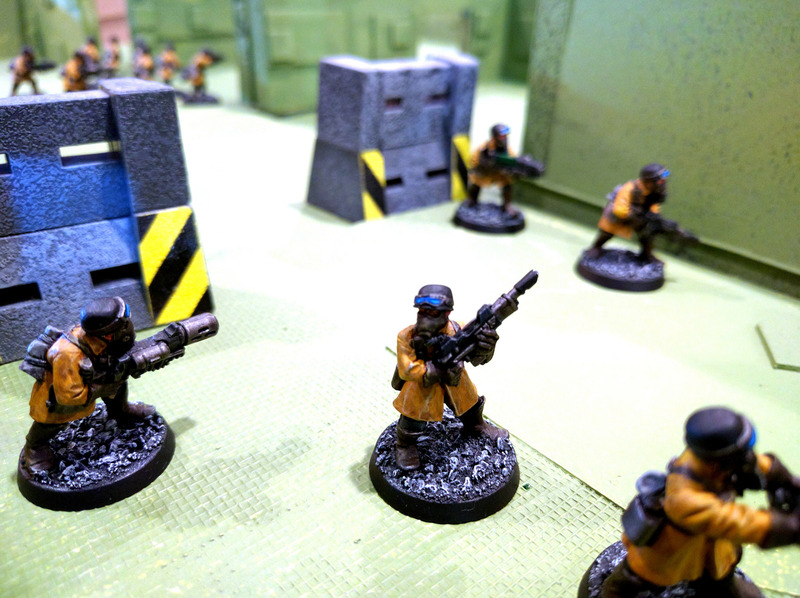 Mission was Vanguard deployment (corners) for table quarters control with bonuses for Slay, surviving friendly Warlords, and no enemy units in your deployment zone. 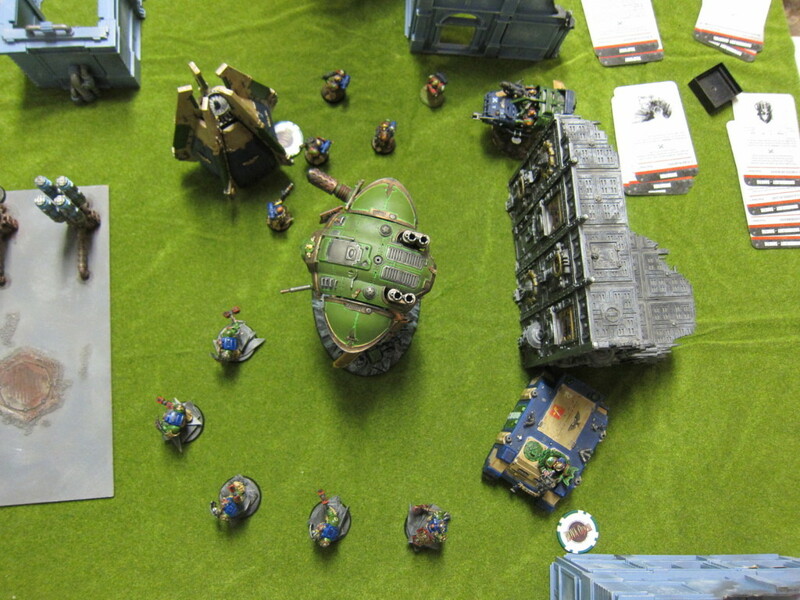 Joint Sternguard blew up a Landraider, dumping out the many Purifiers inside on foot, far removed from our central area. The Sternguard along with reinforcing Raukaan Tacticals and an Ironclad Dreadnought spent the battle in an ongoing fight with them before eventually prevailing. Our Knight got an early lucky hit torching the Grey Knights warlord and his bodyguards. Greenheart and our lascannon teams then wore down a squad of plasmacannon Sentinels before they could target our Centurions. Squad Harbinger put a lot of wounds on a Dreadknight, which then shunted right into the middle of half a dozen Raukaan lascannons. 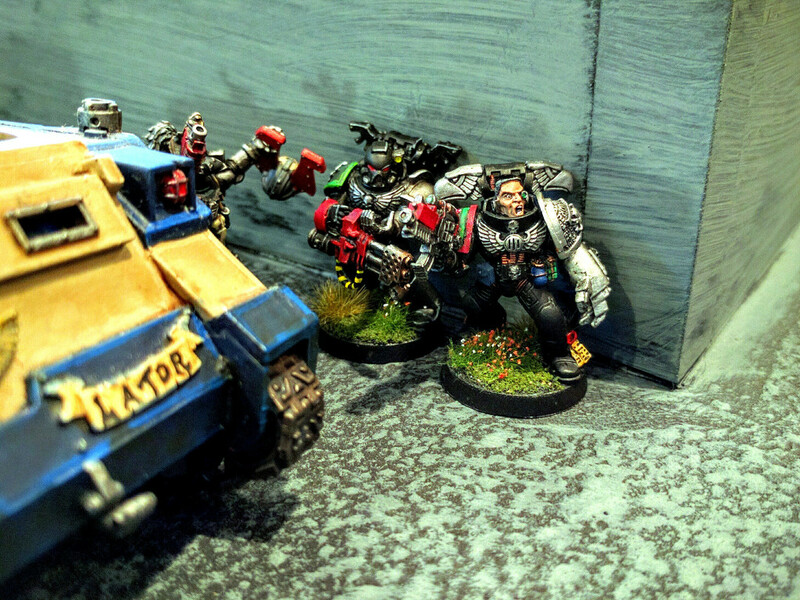 Captain Angholan and Scolirus spent the battle in assault with a group of Bullgryns protecting their Lord Commissar, eventually smashing her. 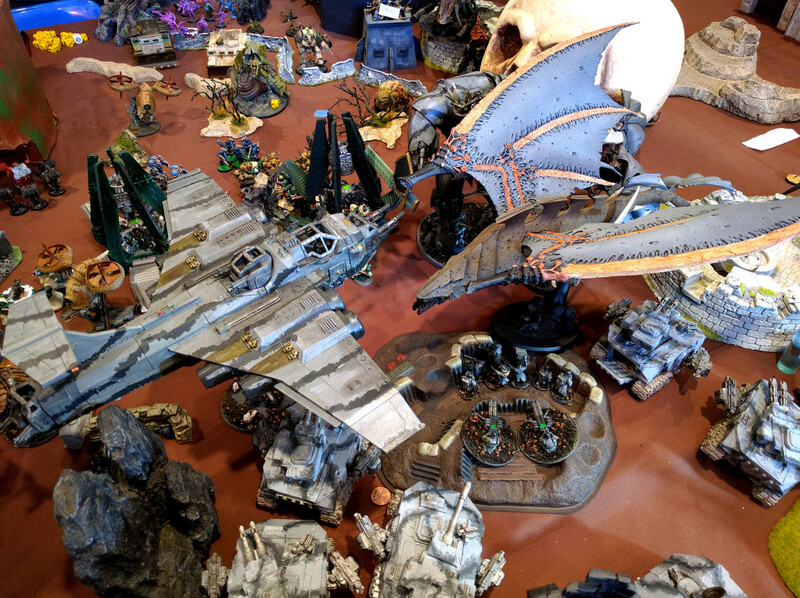 A late arriving Vendetta and Valkyrie harried a thinly held rear table quarter, but were slowly attrited away by Stormtalons and lascannons. We wound up with max points in this one, controlling all the quarters and picking up the secondaries. This battle was very similar to the previous one given the matchup. Again we were fortunate to have many tools, especially the Centurions and Knight Errant, for taking out Terminators. Zack did a great job of drawing it out with his Guard via harrying thrusts all over the board, but with us largely taking out the Grey Knights early on we just had too much momentum. I really liked this mission. 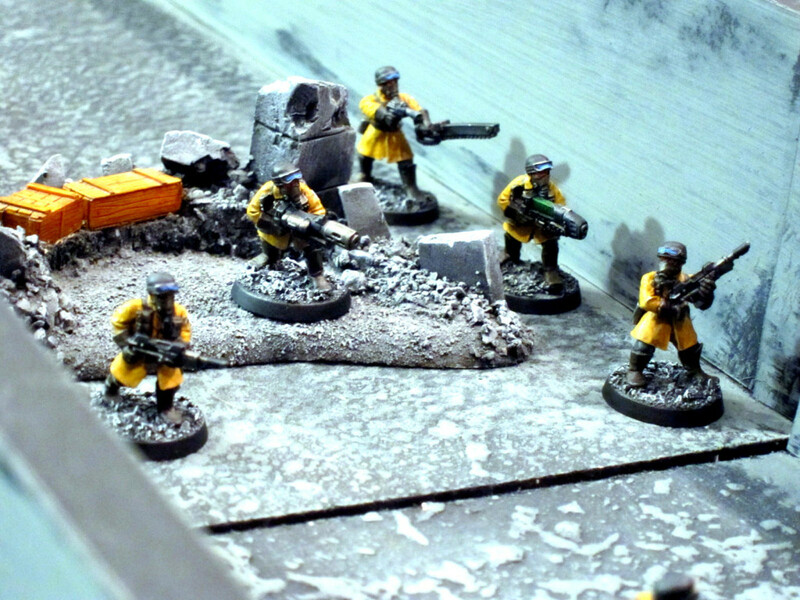 I wouldn’t want to replace standard objectives with table quarters, but it’s a good mix-in. One thing I liked was that because it’s harder to calculate on the fly, and in some ways easier to swing at the last minute, it can be much less clear who’s ahead and by how much, raising the tension throughout. You’re following the wrong path, commissar! Finally we faced Mike and Al with their four Imperial Knights and Necron C’Tan army. Mission was Hammer and Anvil deployment (long axis) for a combination of kill points and objectives, with bonuses for Slay and each surviving troop unit. All three objectives wound up placed in a short line along the table center cross axis. We mostly positioned far forward, as near to them as we could, and held on as long as possible. Join Sternguard got a good drop on one of the opposing Knights but its rerollable save via the Adamantine Lance formation shrugged it all off. The Knights and C’Tan hung back for several turns pinging away at our threatening weapons before coming forward supported by Night Scythes. From there the forces of good got slowly rolled up. We picked up a single point for the Raukaan zapping a Night Scythe, and otherwise gave up an obscene amount of points as all our units except one lonely Drop Pod got obliterated. We felt it was a moral victory that we lasted until Turn 7, but the outcome was pretty much foregone from the start. 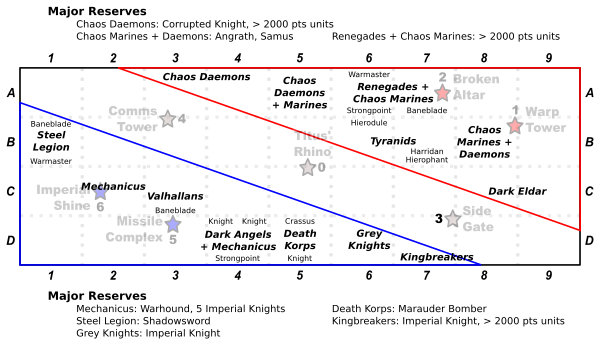 Four Knights with three in an Adamantine Lance, a Transcendant C’Tan, and four Night Scythes with Warriors is a rough force to be looking at across the board. Playing the long axis didn’t help, as it enabled them to lurk out of range of our lascannons for most of the game. I really don’t know how we could have done any better against this army though. 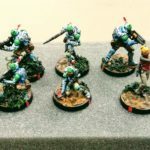 We didn’t come in with any tournament bonuses (early list submission, fully painted, etc. ), but it seemed like few people did so that didn’t matter. Despite the third round drubbing, John and I held on for second place by a reasonable margin. First place, our Knights+C’Tan opponents, were ridiculously far ahead. A couple people quietly cheered us as the “non-cheese real winners.” I was happy with how we played throughout, and the final results. Depending on how you consider the NOVA Trios (we got crushed on games but got the 2nd best prize), that maintains what I believe is still a straight record of 2nd place results for me throughout 2014. 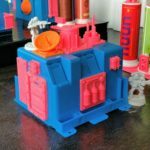 A couple more general thoughts. I’m always hesitant to single out individual units, but it seems very plausible that the Transcendant C’Tan is a gamebreaker. Talking afterward I asked Al what could beat it. He replied “Well, you could buy a Warhound.” I had to work pretty hard to keep a straight face. Eventually he did come up with some other ideas, but they were all generally very specific and substantial purchases. The Adamantine Lance formation is certainly a huge problem. It makes absolutely no game design sense to take an extremely strong, somewhat undercosted unit like the Imperial Knight, and give a collection of them huge bonuses for no additional points cost. Sure, they have to stay within 3″ of each other to get the effects, but that’s barely a limitation for the group in practice. Some of GW’s formations make rules sense to me as a way to fix or buff underpowered units and armies, like the Stormwing formation. A huge problem in frequently being a deliberate cash grab, like the Tyranid supplements (1, 2, 3), but otherwise solid. 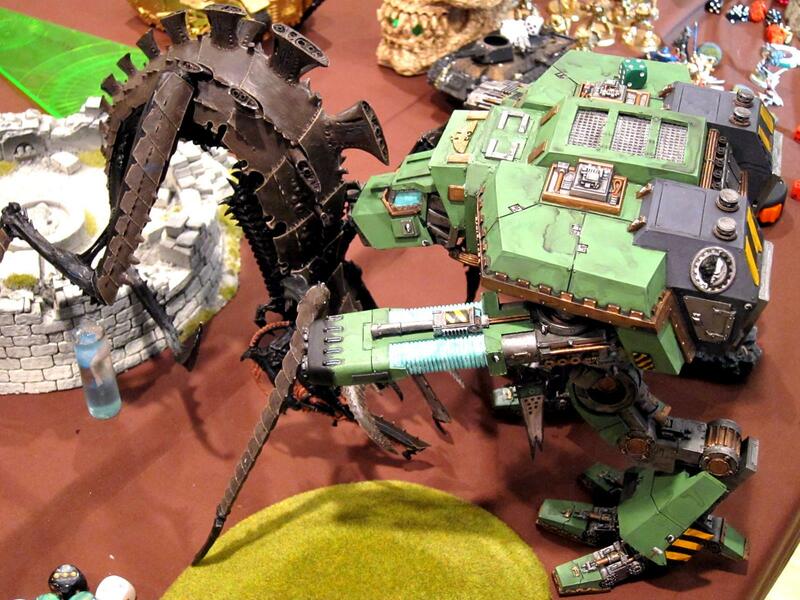 Others like the Lance though are definitely detrimental to both the game’s affordability and its play. The final mission highlighted issues with the scoring approach being used here, and I gather in several of the Berks PA events. Rather than determining games by victory points and then giving tournament points for wins and losses with bonuses for some special conditions, points earned in missions were simply summed throughout. 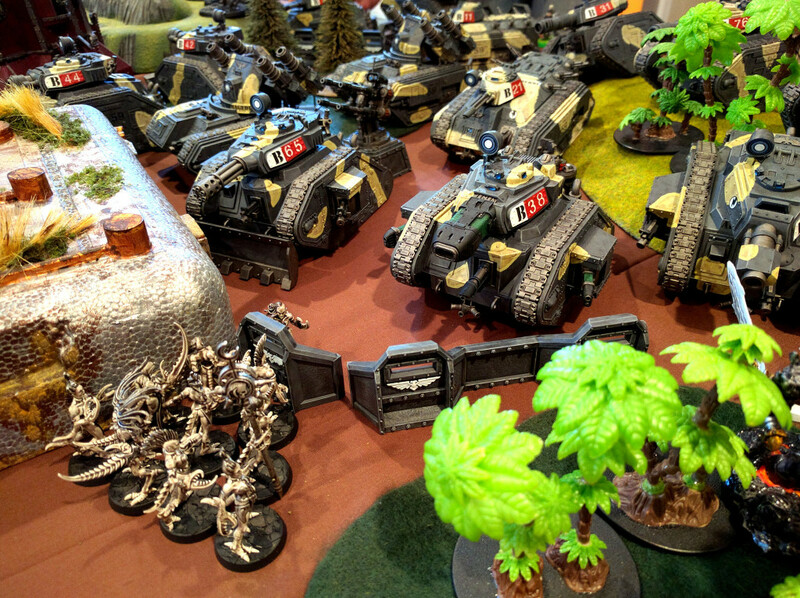 In that last game the entire opposing army would have only given up fourteen kill points total even if we’d somehow managed to destroy everything. Meanwhile, John and I were each fielding that many units. That’s one thing in terms of the problems inherent to kill points missions, but a huge problem for a tournament if that goes directly into the tournament standings. It wouldn’t have mattered, but those last guys got a massive points boost off John & I between the kill points, objectives, and bonuses, unfair to everybody else. In general, tournament points should always at least be capped, preferably normalized. That matchup was also a good example of where optional continuous scoring can really help balance the game. If we could have scored points throughout by holding objectives then we could have played a more tactical game, sacrificing units to try and hold up the oncoming tide with no expectation of lasting to the end. We all but certainly would have still lost, but potentially we’d have stood at least a chance of not being completed wiped on points, given that our opponents had so few units with which to attempting claiming and holding throughout. On a final note, three thousand points total is probably too many points for a doubles game. Somewhat counter-intuitively, they tend to run slower anyway. At that many points there’s just a lot going on to begin with, and doubles games can take a very long time. That’s particularly true if at least one side is active in all the phases. It seemed like Colin and Brett really suffered from this, with several of their games cut short when they would have benefited from more turns. 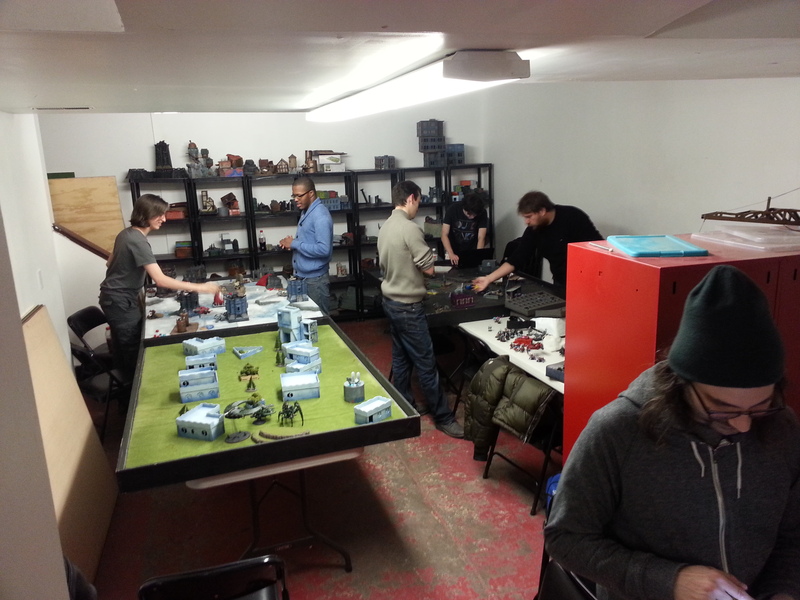 Despite those concerns about the scoring and the serious balance problems built into 40k itself right now, this was a super fun event, well run in a low key but smooth manner and with a great crowd. Berks is going to run another team tournament in January, and I’ll definitely try to make it to that. Again, more photos are in the gallery.